When the skin under a new tattoo becomes raised, there may be a scar developing. Aloe vera gel, applied a few times a day, can help flatten and remove the scar altogether. When you get a tattoo, you want to make sure that your artist really knows what he's doing. If he doesn't, you may end up with a scarred tattoo, and scars can last a lifetime. Scarring happens when the tattoo artist digs in too deep with the needle (one of the reasons why an experienced artist is a must). Sometimes it isn't the artist's fault, however. Scarring can take place on sensitive skin that heals slowly and is more prone to scarring in general. What does a tattoo scar look like? Generally, you can't tell it's there unless you touch it. It is raised skin tissue wherever the needle went too deep. Sometimes if the scar is bad enough, it can distort the tattoo and the ink. I've even seen scarring that makes the darker colors override the lighter colors. Raised skin: The main sign of scarring is raised skin. The skin will vary from slightly raised to larger bumps. Typically, the raised skin will be around the outline of the tattoo, but it can also appear to be on the overall tattoo. Itchiness: The tattoo site becomes itchy. Step 1: Cut off a section of your aloe plant and squeeze to release some juice. 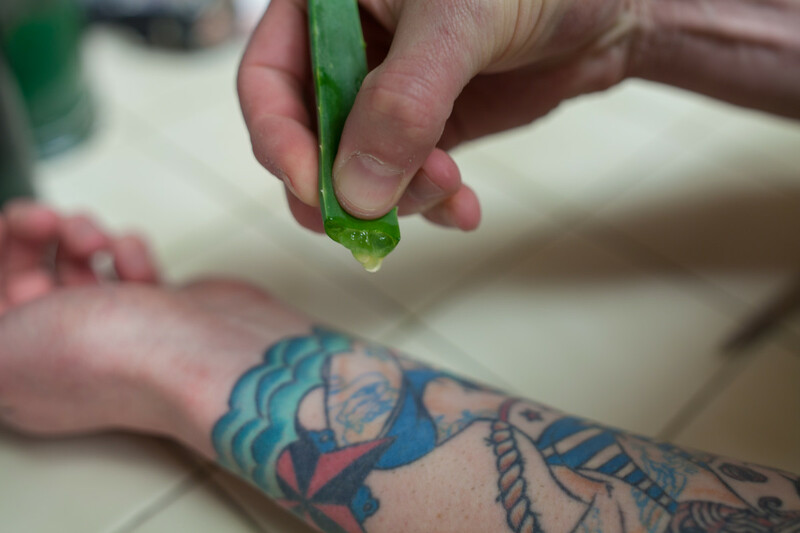 Step 2: Rub the aloe directly on your tattoo. The scarring can be caused by anything, ranging from improper aftercare to sensitive skin. With most, scarring does not occur, but if the tattoo artists goes too deep with the needle or works the skin too hard, scarring can result. Assuming everything went well with the tattoo and you are healthy, you should not suffer any scarring. 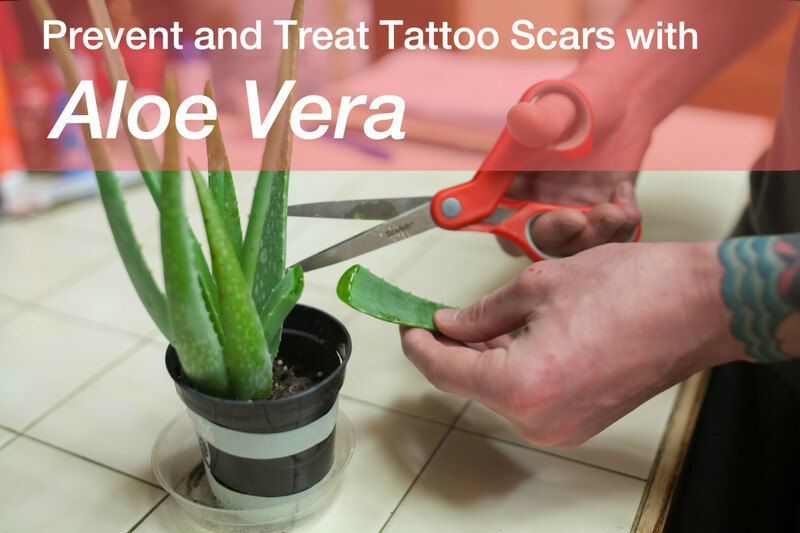 But, if you do, aloe vera can minimize the look of a scar from a tattoo. Using aloe directly from a plant gives you the best results. You need to first identify the scar. Scarring under a tattoo can appear as raised skin or prolonged healing. 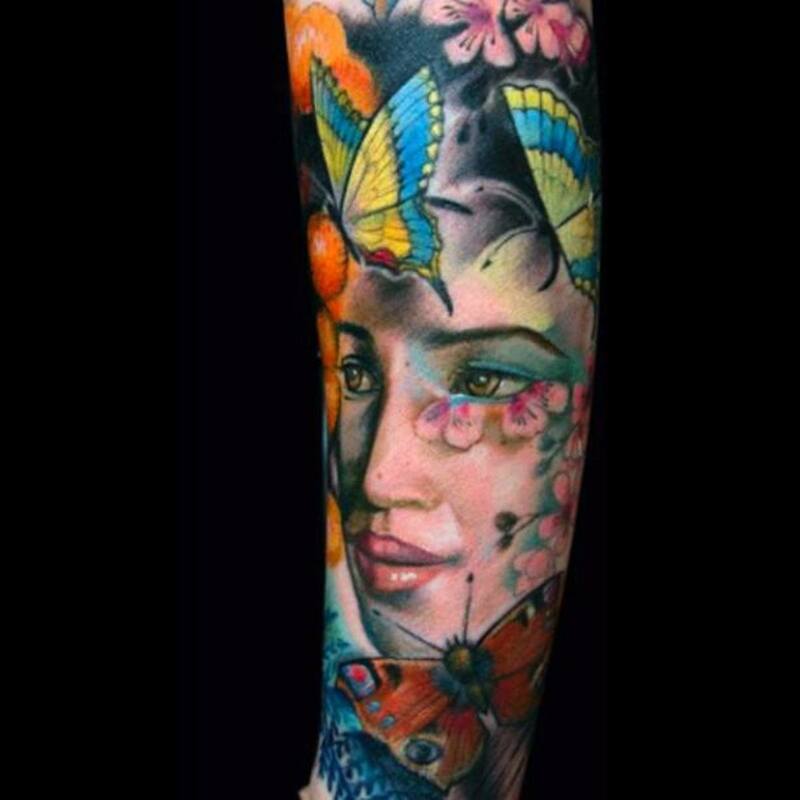 But, for the most part, scarring under a tattoo can be tricky to identify because the ink will distort the skin. Purchase an aloe plant. These are typically found at gardening stores and departments. You shouldn't need a large plant, but make sure that there are several thick leaves, as you will have to alternate between the leaves, allowing the plant time to regenerate and heal itself. Tear off a small piece of a plant. Then, squeeze the aloe onto the tattoo and rub it into the scar. Allow the aloe to dry completely. Repeat this process a few times a day until your skin is flatter and the scarring has been minimized. Be patient. Healing takes several weeks. But, if you are not satisfied with the amount of scarring minimized during the process, you may consider a doctor or laser resurfacing. Hi, a couple days ago I added to an old tattoo I have on my back & I got the old part touched up, but the old part got more swollen than the rest & is risen right now. The tattoo artist said it might be because he went too deep back when I got it. Is it going to stay that way?? & should I use aloe on it or what?? My tattoo is a week old but i can notice the scars, isnit okay for me to apply aloe? Hey, good day, can i use again the aloe leaf after i used it? And how about the remaining leaf that i cut can i use it also? Looking forward to hearing from you! Thanks! A&D is a cream or ointment that you can purchase at your local pharmacy or grocery store. 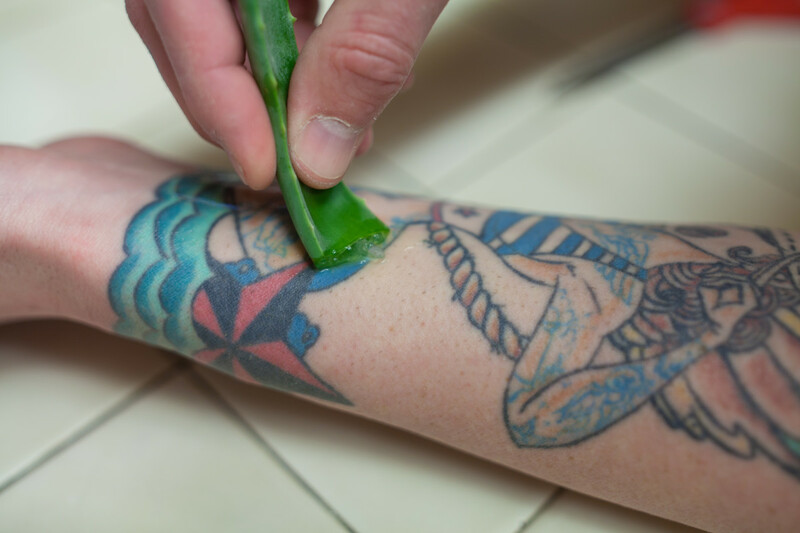 I love using aloe when my kids get a sunburn but to use it on a tattoo seems so wrong. I have a tattoo that I got about 2 months ago,I let my brother and law who's not a professional give it to me.im very prone to scarring,and he went way to deep and the entire cross is scarring,I've been putting aloe on it but it just seems like it's getting worse. What do I do? I'm young I don't want my first tattoo to just be one big scar! I've had this tattoo on my arm for years now and I noticed that it is scared pretty bad. I found out after complaining to the owner that the guy who tattooed me was new and I was his first tattoo in years. What's weird though is that the tattoo feels perfectly flat, unless I scratch it and then the entire thing raises and becomes 3D. Almost reminds me of an allergic reaction. Is this normal? Aquaphor. Use it for tats, all stages. You don't need any other garbage and nonsense. 1 product and that's it. Why are you all using different products? Just use 1 and stick with it. You should have gotten care sheets when your tattoo was done. If you didn't, don't go back to the artist. They are BY LAW supposed to provide you with it. i've had a fairly large tattoo on my back for over a year now. my outlining is bumped up but the shading is perfectly flat. it doesn't itch frequently and the look of the tattoo hasn't been changed by the scarring. it's my first tattoo but i'm kind of afraid to get any more incase they scar worse than this one. Also, i dont think this is really on the topic but my tattoo is shaded in black and white- no color. For longer than a month after getting it my tattoo was red. I actually thought the artist had used red ink, until it finally faded away. could sensitive skin cause the area to stay red for that long? Hi all! I got a tattoo on my wrist about 4 weeks ago (black and red words) and it seems to be healed (it's no longer sore or itchy and was never "crusty" or scabbed), but it's still raised rather than being flat. Should I give it some more time (weeks? months?) before I start applying Aloe, A&D Ointment or Vitamin E oil to try to smooth it out or can/should I do that now while it's still somewhat "fresh"? I would love to have your input!! Thanks! Hi. I had 4 tattoo in different bodyparts. All was inked by one artist. One particular tattoo started having some white bubbly spots and I believe scar or scab like symptoms. I tried the aloe and vandol cream but the skin seemed to be wounded. Any other remedy you can recommend? 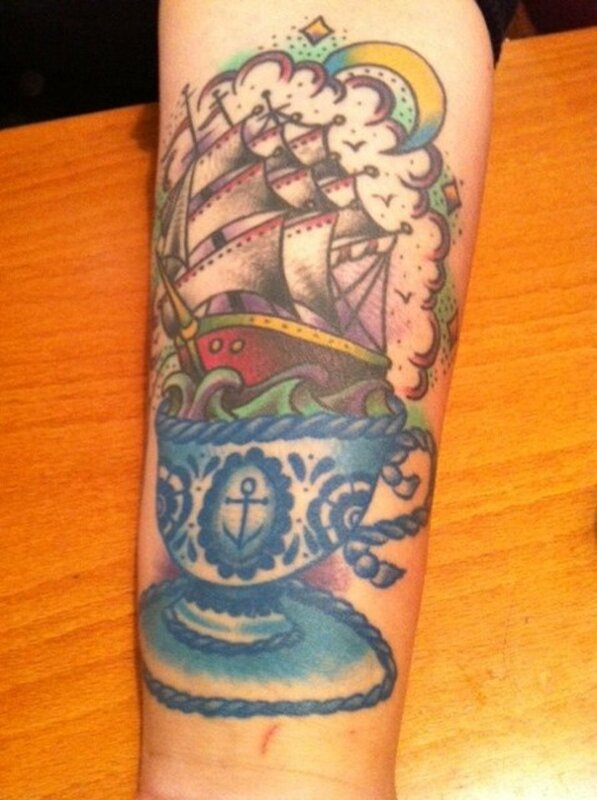 apart from having a touch-up after it fully healed. Vitamin E oil works well with scars. Moisturize it. Use a lot of triple a, aloe plant or aloe products without achochol in it, and oil products. It will eventually start removing the scar tissue. You will lose some color on the scar tissue but you can always get it touched up to what the color used to be. I got a small tattoo 3 months ago - it seems to have a thick white hard crust on parts of the tattoo. Will this white crusty scab ever go away? What can I do to make it look better? Should I keep it dry or should I moisturize it? Help? I recently got a large piece on my back. It's my first tat and I'm stupidly trying to fit it all in within a couple of weeks before I move out of the country. I was wondering if natures aid will help it heal faster, or if it would be the same as the vitamin E I'm using right now. I've used natures aid before for cuts and burns, but not sure how it would react with a fresh tattoo. If anyone else has used natures aid in their healing process I would love to know how it turned out. I have a tattoo in the center of my back and it's a pretty big piece. It needs touched up bad! But I'm scared to death to get it touched up! It's most definitely scarred! All of its raised, ink bleeds out of the lines, and the center of it is very faded due to at first, it was blue, but once we saw the blood coming through, decided to make it red, so he went instantly right back in and changed the color to red. It of course made the center of the tattoo very mush and took a long time to heal. During the healing process, I didn't care if it got faded or not, just didn't want to get an infection so I was putting neosporine on it. It's been bout 2 years now since I got it done. It's still very itchy and bubbled. When ever I go to scratch it, it is VERY sensitive. If I was to use the A&D technique, will this help with the tenderness also with the scarring? I want to get it fixed by someone professional, but I'm scared to death on how bad its going to hurt. First tattoo. Some color came off & now it looks like a deep cut. What should I do? ive had scar tissue under my tattoo for a while and i think it looks horrible. ive been using lotion and massaging it so see if it will help any . does that work to? Hey... I'm covered in tattoos, all of them holding up really beautifully over the years (decades) I've had them. Recently the one I just got on my wrist is pretty scarred, milky still, but the colours are coming through everyday. I am using castor oil (the food/body grade, NOT the stuff you put in cars of course)... it's well known to rid the body of scars, even after years of them being there. Google it. Aloe (as recommended above) is awesome as well, just try to avoid the cheap shite with a bunch of alcohol in it as filler. I use an aloe 'cream' that is just pure aloe with a tiny bit of tea tree, rosemary, vitamin e and witch hazel. (Natures Aid) it works amazing on all tattoos and pretty much any other skin condition for that matter. Worth a whirl. I recently got a tattoo ... its been about a week and a half ... i had seen his other work on friends and loved it. i have had tattoos done before so im not new to this. However this is the first full color tattoo. anyway a week and a half later and its mostly scarred ... especially the black and red. it doesn't itch, it never started itching (which is what worries me) when should i consider using aloe ... i had to stop using a&d because the ink would run out ... i have never ever had this problem before and i have a back piece and several other smaller tats. this one is on my calf and what little of the scarring that has come off (on its own) has taking some ink with it. I have been working on my back piece, and we did the background on my shoulderblades and just under my neck. The neck part was super painfull, and has scabbed badly. The rest of my tat, including all we did before never did this. What was done on my shoulder blades is healing normally. I have got super sensitive skin, and was wondering if the scabbing is possibily from the artist going to deep on that one section? I did the normal aftercare as I did with the rest of my tat, since the scab has come up been using bio oil & vitamin tissue oil hoping to reduce any damage from the scab, do you think i am doing the right thing? I got a tattoo on my arm about 3 months ago. The outlines are all raised and puffy. The skin is dry and itchy over it. Is there nay chance this will go down, or will it stay like this forever? 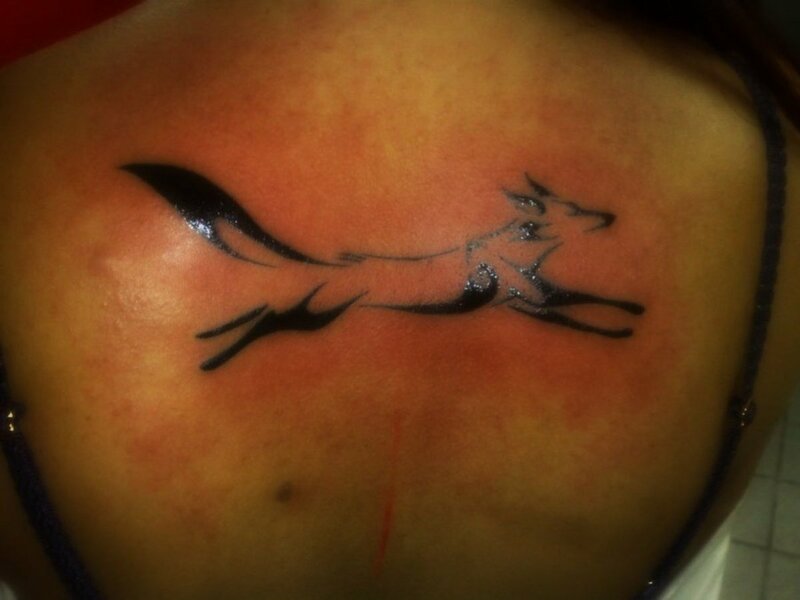 soo i got a tattoo in january.. almost a yr ago and recently ive realized i have some pretty bad scar tissue. its a small one on my inner wrist so im lucky that not many ppl will see it but every single time i look at it. i see the uneveness and it makes my tat feel so.. unadmirable? haha i decided it would be a good idea to use vitamin e ointment (which is what i was told to put on it when i first got it) vitamin e and aloe are pretty much the same thing... do you think im ok? or is the actual plant more potent? I do scar. I had a mole removed on my chest and it was puffy and pink for more than a year. The mark is still there, as a bump, but not pink anymore. Do you think a tattoo would react the same for me? This is a hereditary scarring, as my mother has it and 2 of my sons. I was thinking of getting something small in a hidden place first to see how tattooing affects my skin. Would you recommend any other ideas? Hm.. Honestly, I'm not sure. After a year, the tattoo shouldn't hurt. You may want to see a tattoo artist to have it checked out. Is it red or inflammed any? How long have you had it? How did you, or are you, cleaning it? i got a tattoo on my hand and torso...just the outlined is scarred from the artist diggin me...its raised itchy, and if you hit it or scraper it...it hurts like helll...any suggestions on why or what can be done to at least get it to stop hurting? It's probably not a scar. Scars are raised, not indented. 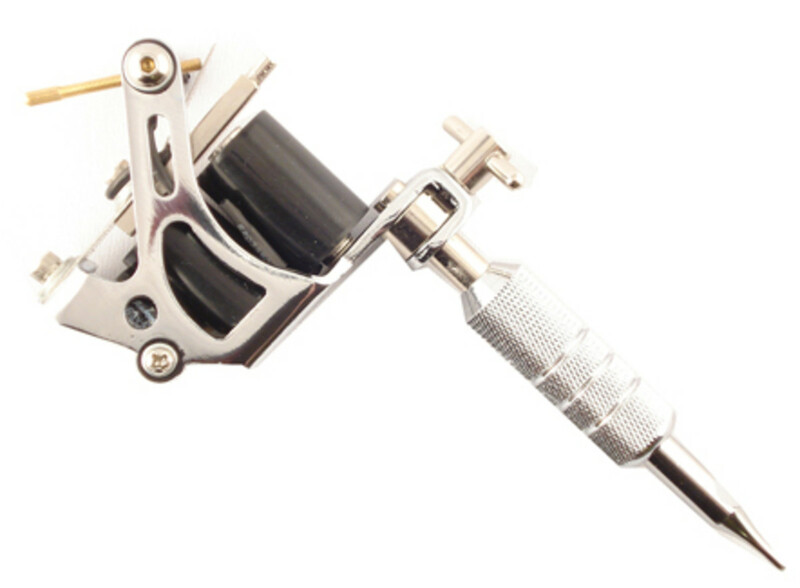 The indents are in your skin, it's not going to have any effect on the tattoo. If you have it redone, more than likely the indents will still be there. I have a small tattoo on my foot and there are about 5 small indents around the edges. To me it looks like the artist pushed to hard and it left dents in my skin, even though above it says I would have raised bumps. Are the indents on my foot scares and would I be able to get my foot tattoo redone or will the indents affect the redo? I had a tattoo done on my wrist 2 weeks ago. My healing process was very difficult (rash and a lot of oozing and scabbing). Everything has quited down and my healing process seems much better, however, my tattoo still looks milky and the skin over the tattoo is a little shiny and wrinkly. My tattoo is not raised from the surface but the skin underneath (with no ink on it) is a little pink. Is this normal and part of the normal healing process? I'm not really sure what you're talking about. It'd be easier to understand with a picture. I had some work done on my forearm, about a month ago, just an outline, it's all healed fine, with an exception of six dots all near each other. They're exactly as big as the dots on a die. It also appears as if there is a layer of skin over those six dots. In my opinion, if it was an allergy, the raised tissues would be all the time, not just throughout the day and be gone at night. I would go to the tattoo artists you used, and have him look at it. When I wake up in the morning, my skin is pretty much flat - my tattoo is not raised, bumpy, or itchy. However sometimes at night, or throughout the day, it can get distinctly raised and itchy - i can notice it pretty easily if I touch it. My question is, some people have told me this is allergy to the ink rather than scarring. Could it still be scarring if it sometimes is not raised at all? 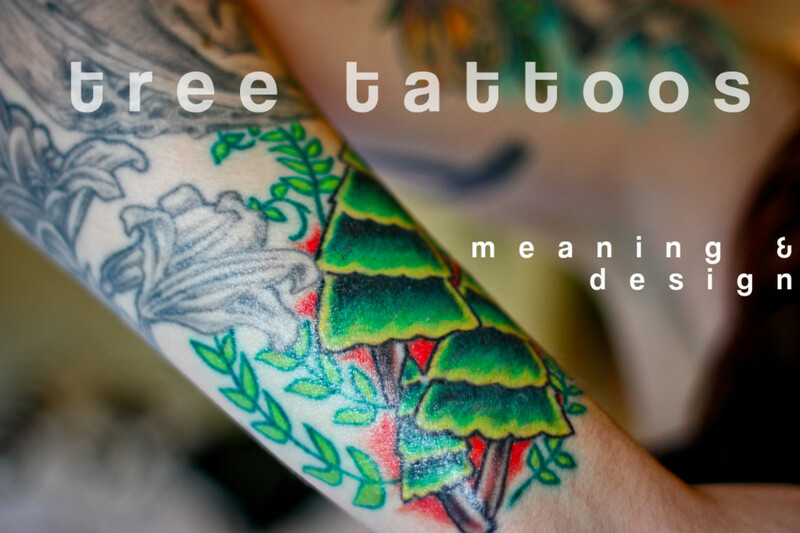 If your tattoo has scars (raised parts) use Mederma, Neopsporin, or A&D. Ive seen a lot of people have success with just consistantly using A&D ointment to reduce the raised parts significantly. I'm not talking about during the healing process, I'm talking about after it's healed and you know or think it's scared. Everyone has different skin. I know a black tattoo artist that's been doing it for a long time and predominantly tattooing black people also. I remember when I seen a friend of mines tattoo who is really dark. It looked all scarred, shinny rough snakeskin around all the line work, for a couple months and then it went away. I was shocked. I thought his skin was damaged. I think that's just how really dark skin heals? I've also seen black people with scarred tattoos so...Not sure... but everyone's skin is different. Most people should not scar from getting a tattoo and that's why you need to go to someone experienced who knows the techniques to get the ink in your skin without going too deep. 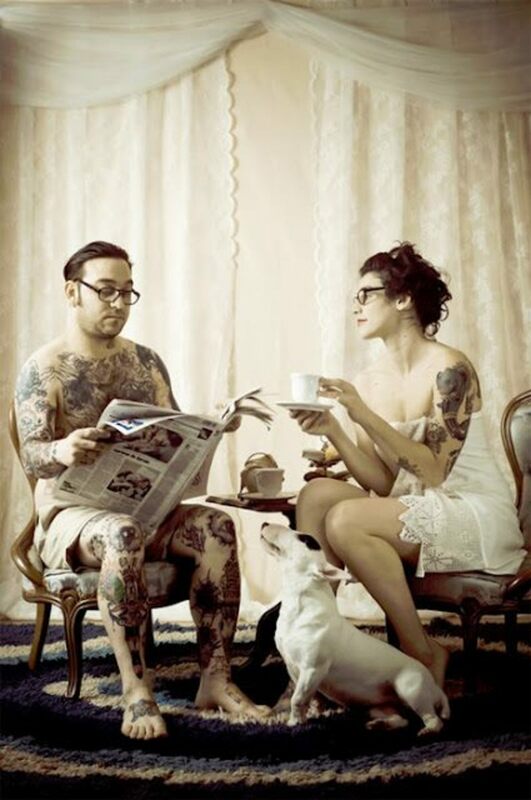 Ink can also be another factor in tattoo irritations. I've heard from a lot of people their tattoos itch sometimes and have little bumps underneath. Again A&D seems to help when applied consistently for a bit. You are putting a foreign object into your skin there are side effects but the inks are made in such a way these days (or should be) that they minimize allergic reactions, and don't use toxins, etc. I personally have never had any of this happen to my tattoos so I don't know what the deal is. Hope that helps some. It sounds like the tattoo artist doesn't know what he's doing. If you get another tattoo, find a new artist. I have a pretty badly scarred tattoo all the way across my back, I thought it may have been because my skin was that much more sensitive in that area, but I got a tattoo on my arm from the same tattooist and it also scarred. I had a tattoo on my wrist done by a different artist before and it lays perfectly flat. It gets incredibly itchy in the summer and when I sweat and it's distorted in places and unsightly, it's a shame because the skin on my back was flawless! What were your aftercare techniques? When healed, you can get it touched up, but scarring typically won't go away. Is it scarring or fading that you're noticing. Mederma will more likely fade the tattoo. Also, is Mederma an option for tattoo scarring? I think that my newest tattoo has possible scarring. It may have been the aftercare that sealed the deal. My question is, when can I get it touched up? I wouldn't suggest it, but it would be best to ask your tattoo artist for the best answer for that question. Actually, it may benefit it, as you would normally use aloe on a wound. But to make sure ask your tattoo artist just to make sure. the scab came off while in the shower and started bleeding. its been 2 days since and the wound healed and the tattoo itself finished peeling. do you think it's ok to put aloe on it already? i want to minimize the scaring. or what else does anyone recommend. thank you. I wouldn't really suggest it. can you put the aloe on the tattoo while you're still in the healing process?